This item is a global-type mob drop and is forageable in all TDS zones. 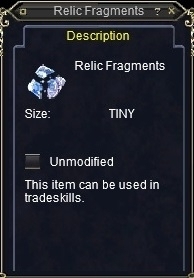 I am looking for a good place to farm Relic Fragments. Does anyone know of a good location? Anyone know an especially good place to farm these? I've tried foraging. Foraged consistently with advanced foraging skills for about and hour and 20 minutes in Tempest Temple and didn't get a single one. They are just super rare - in Katta Castrum after 2 hours of foraging (with the double forage AA), I got 125 waters, 100 geodes, 10 roots, 8 lava rocks and *1* relic fragments. Got one on a coral serpent during Tempest Temple Heroic Adventure Storm of Sorts. Can this be foraged ? Has anyone foraged these in any of the new zones? Yes, I got two the other day in one of the two open starting zones. But it's painfully rare.